Fancy a Fiji cruise? Find out with Captain Cook Cruises Fiji. Explore the stunning Fiji islands with your choice of cruise lengths and destinations. A Fiji cruise is a must for every visitor. 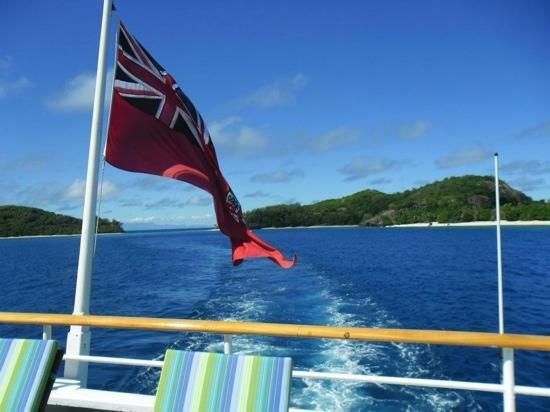 And if you are staying at a resort, why not add a day cruise to see more of the Fiji Islands. A day cruise suits those who already have things booked and want to add a full-day outing. From experience, it was a wonderful trip and a full day's worth of highlights. Day cruises leave daily from Denarau Marina (Denarau Island near Nadi) at 10.00am returning at 5.00pm. Captain Cook Cruises has a 3-hour sunset dinner cruise that leaves from Denarau Island. You need to check for availability, so booking in advance is recommended. The Yasawas epitomize gorgeous Fiji. A chain of 20 sparsely populated islands having abundant sunshine and stunning beaches. Here you will laze on the warm sands, bask in the crystal clear waters and snorkel in spectacular blue lagoons. Captain Cook Cruises offer small ship cruises, tall ship adventures, sailing safaris, day trips, elegant lunch and dinner cruises, plus island stays on their private islands Tivua and Drawaqa. Overnight stay - an overstay stay on Tivua Island is possible for up to six guests. 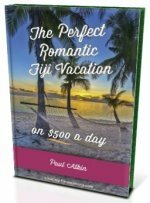 Recommended for Fiji honeymoon couples and a chance for exclusivity. There are two 7-day cruises available. 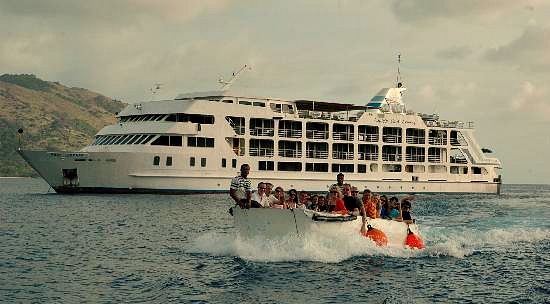 There's a cruise that leaves from Lautoka on selected dates usually the first Tuesday of each month at 1:00p.m. 7-Night Discovery Heritage Cruise - On the Heritage Cruise you’ll visit remote places as you embark on an adventure from the south-west coast of the main island, Viti Levu, to the remote Taveuni and Vanua Levu islands and across the 180th meridian. Stand on the 180th Meridian - the arbitrary Dateline between today and tomorrow - and I guess you can claim to say you have time-travelled! 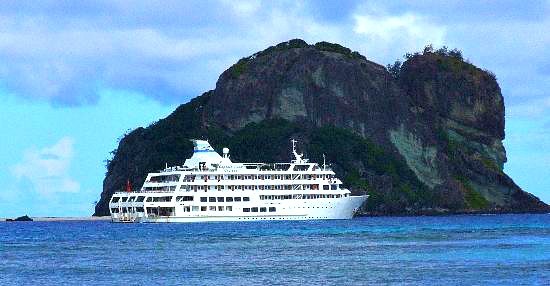 7-Night Discovery Cultural Cruise - On the Cultural Cruise you circumnavigate Vanua Levu, Fiji’s second largest island. In the process you'll explore islands including 3 different cultures, rivers, rainforests, iguanas, and search for manta ray's natural hatchery to name some of the Fijian sightseeing delights. Visit our Captain Cook Cruises in Fiji section for more about their operations in Fiji including further options such as honeymoon packages and sailing/chartering ships.